Lord Mandelson has said he is “praying” for an early general election as a means of deposing Jeremy Corbyn as Labour leader. The former Cabinet minister was speaking after months of speculation over whether Theresa May would go to the polls while Labour is struggling with low ratings. Last night Mandelson, an architect of New Labour, suggested that an early vote – which many commentators have said would lead to a Labour defeat – would prompt the departure of Corbyn. 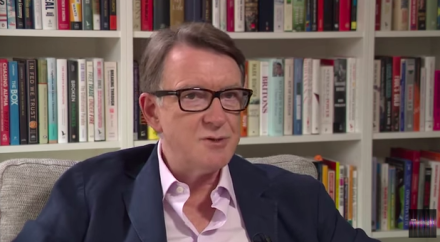 When asked about the likelihood of an early vote, Mandelson said: “Bring it on so we can deal with the awful situation in the Labour party earlier than 2020”. His comments – made at a Royal Television Society conference and reported by The Guardian – come two weeks after a study showed that Labour’s poll ratings are the worst it has had in opposition. May has ruled out calling an early election but has faced persistent rumours she will go to the country in the spring if Labour continues to poll at a modest rate. Yesterday a Survation poll for LabourList showed the party had slipped back on a series of key campaigning issues, including the economy – although the Tories have also been hit or remained flat on core voter topics, such as immigration.